Today you want to be “on your toes” and prepared for whatever opportunities — or peril — that comes your way. 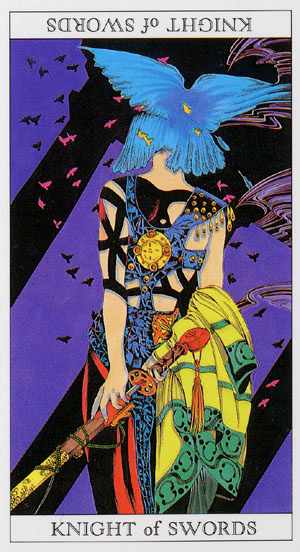 The Knight of Swords is sharp, focused and purposeful, aware of his (or her) environment and quick to act if need be. In traditional Rider Waite type decks the Knight of Swords is literally a knight in shining armor, charging ahead into battle or to rescue his fair maiden. But here we have a young hipster-soldier girl standing watch under a bird-filled sky. She herself resembles a bright and colorful bird, from her hair to her coloring to her clothing to her complete immersion in the scene before her. But these birds aren’t flying south for the winter: they’re circling above her in what could be a menacing formation. She keeps her sword ready but holds it behind her until she knows for sure. The Knight of Swords often delivers news. Sometimes it’s good news and sometimes it’s not. But like the young warrior in our card, your main objective should be to stay alert and be prepared to act quickly and decisively either way. The Knight of Swords is quite good at getting to the point, but comes up short when it comes to tact and diplomacy. Therefore if it turns out that it’s you delivering the news today, be mindful of your tone, manner and especially your choice of words. thank you! I really loved this card and felt that it called for whimsy!